Magic Chef wine coolers are distributed by MC Appliance Corporation for major appliance retailers (Homedepot) in the US. Besides wine bottle coolers the company markets microwave ovens, refrigerators, freezers, ice makers and other small kitchen appliances under various brand names (e.g. Ewave). Magic Chef wine refrigerators are designed for short term storage of wine (max. 1 year). They have electric temperature control for setting the ideal storage/serving temperature for your wine. 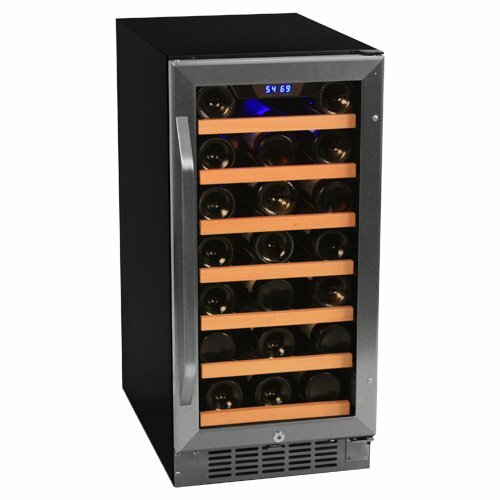 Inexpensive wine coolers like the Magic Chef units make proper wine storage affordable for wine lovers on low-budget. Regarding size Magic chef offers compact, countertop wine coolers with 8 bottle storage capacity up to larger, under the counter units that accommodate 30-52 bottles of wine. Cooling system – the 8 bottle countertop models (MCWC8DCT2, MCWC8DCT3 and MCWC8DSCT) have thermoelectric cooling with the benefits of silent, vibration-free operation. Find out more about thermoelectric (also known as Peltier) cooling. All units are auto defrost. Temperature Control – except for the 16-bottle (MCWC16MCG) and the 30-bottle (MCWC30MCG) units, all models have easy-to-use digital controls and display for adjusting and monitoring the cooling temperature. 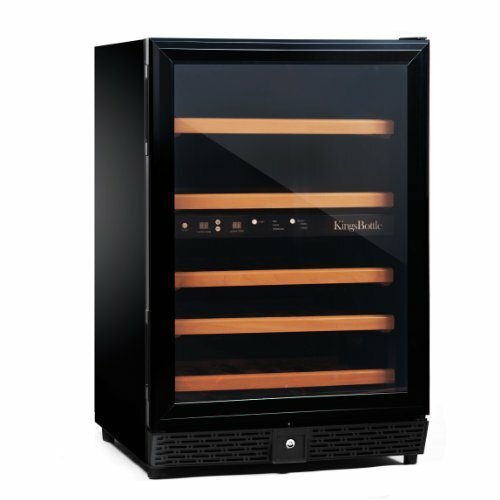 Number of Zones – there’s one dual zone model with two independently controlled compartments (Magic Chef MCWC44DZ 44-bottle wine cooler). The other models have one temperature zone. Shelving – chrome-plated slide-out wire racks are used that are designed to hold standard (750 ml, Bordeaux-style) wine bottles. Odd-shaped (long neck or wide) bottles won’t fit in. Placement – The countertop models and the smaller units are for freestanding placement because they need a few inches space around the cabinet sides and at the back and top for proper ventilation. The larger units ventilate in the front so they can can be used either as built-in or as freestanding. TIP: see other countertop wine coolers and built-in wine refrigerators. Warranty: all models carry 1 year warranty on parts and labor and 5 years on the compressor. 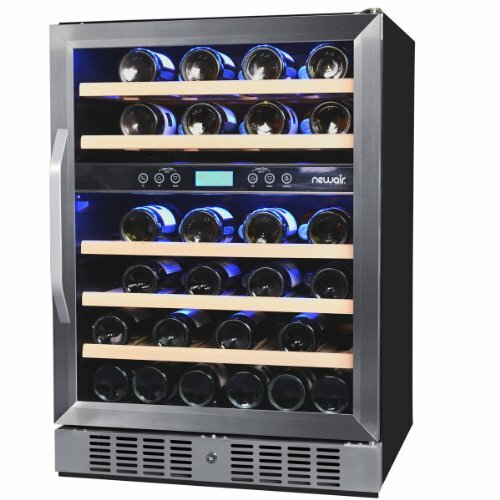 Price: Magic Chef wine coolers are at the lower-end of the wide spectrum of wine coolers and home wine cellars. Consumer Reports – What Do Users Say? The most common problems with Magic Chef wine fridges reported by users on review sites is that the compressor is cheaply made and it tends to fail after 1-2 years. Even if it is under warranty and you are offered a replacement compressor you’ll still have to pay for shipping and installation. Here are some of the strengths and weaknesses of Magic Chef wine fridges based on user reviews. Who Should Buy a Magic Chef Wine Cooler? Magic chef and simialr low-cost wine refrigerators are recommended for those who can’t afford or don’t want to spend a lot on a pricier wine bottle storage and cooler, however they do want to keep their wines at cool temperatures (45°F – 58°F), away from sunlight for a couple of months before consumption. An inexpensive wine cooler, like one of the Magic Chef models, provides great alternative over storing wine in an ordinary kitchen fridge next to all the food stuff (food odor can get into the wine through the wood cork over time). The units look attractive and quite sturdy but there are user complaints on some models saying that it broke down after a 1 or 2 years or that the cooler doesn’t maintain temperature well (expect a couple of degrees of fluctuation in temperature from cabinet bottom to top). Dimensions (W X H X D): 16.5″ X 11.25″ X 20.7″, Weight: 22 lbs. Dimensions (W X H X D): 16.1″ X 9.8″ X 19.7″, Weight: 24.3 lbs. Price of 8-bottle countertop models: cc. US$85 – 110. TIP: see how the Magic Chef 8-bottle models compare to other 8-bottle wine coolers. 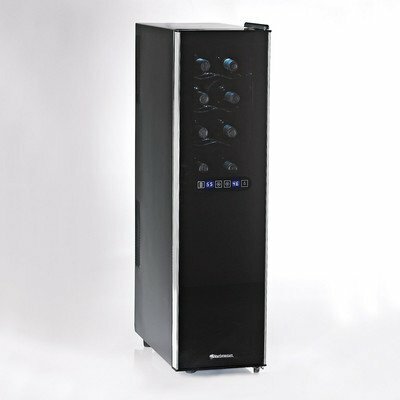 The Haier HVUE08ABS wine cooler looks very similar and has the same features as the 8-Bottle Magic Chef models. The larger units listed below use compressor cooling technology. Dimensions with handle (W X H X D): 18.6″ X 19.9″ X 19.3″, Weight: 53 lbs. Price: cc. US$ 180 – 210. TIP: see other 16-bottle wine cooler refrigerators. Dimensions with handle (W X H X D): 19″ X 33″ X 21.17″, Weight: 75 lbs. Price: cc. US$ 300 ($10 per bottle). TIP: Read User Reviews on the Magic Chef 30-Bottle Wine Cooler. Take a look at other 30-bottle wine refrigerators. Dimensions (W X H X D): 20.6″ x 32.5″ x 23.5″, Weight: 70.5 lbs. Price: cc. US$ 150 – 200.
mechanical thermostat, temperature control knob inside the cabinet, temperature range: 46ºF – 59ºF, setting is same as the MCWC45A’s. Dimensions (W X H X D): 20.6″ X 32.4″ X 22.4″, Weight: 77 lbs. TIP: see more freestanding home wine cellars. Model MCWC50DBT, temperature range: 43ºF – 64ºF. Dimensions (W X H X D): 23.4″ X 34.3″ X 22.8″, Weight: 103 lbs. Model MCWC50DBTC, temperature range: 39ºF – 64ºF. Dimensions (W X H X D): 23.4″ X 34.4″ X 24.4″, Weight: 102 lbs. Dimensions (W X H X D): 23.4″ x 34.4″ x 24.4″, Weight: 101.4 lbs. All four models can be installed either as built-in or as freestanding. Price: cc. US$ 170 – 250. The coolers have digital temperature control with preset temperatures for red and white wines. Contains interior light. 5 slide-out wire racks, each holding 8 wine bottles and 1 fixed bottom rack. Model MCWC50DBTC has the digital temperature display outside the cabinet, integrated into the top door frame. Review (by Robert): First unit was so loud that we returned it. Second unit has worked fairly well, but never seems to cool to my programmed temperature. Also, the door gaskets have magnets that have torn free from the inside of the gaskets. Seems the unit is a bit cheaply made. Dimensions (W X H X D): 23.4″ X 33.6″ X 22.6″, Weight: 112.5 lbs. Price: cc. US$ 170 – 250. See more 40-50 bottle wine refrigerators. 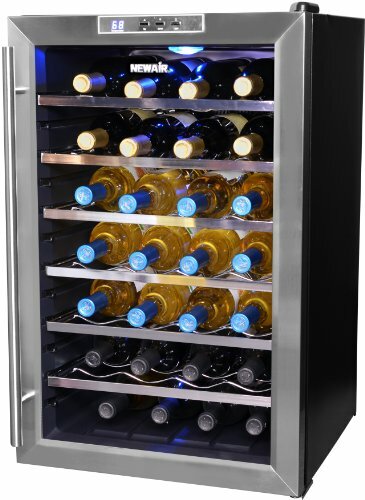 Magic Chef currenty has one two-zone wine refrigerator that stores 44 bottles of wine: 16 in the top compartment and 28 in the bottom compartment. Read a full review on the Magic Chef 44-bottle Dual Zone Wine Cooler, Model MCWC44DZ. TIP: Other Two Zone Wine Home Wine Cellars. Edgestar Wine Coolers – main features of Edgestar wine coolers, including an overview of available models. Koolatron Wine Coolers – overview of models describing key features and benefits. NewAir Wine Coolers – cheap thermoelectric home cellars made in China. Sunpentown Wine Refrigerators – quick overview of models including the most important features and benefits.